Vtech - AT&T Digital Answering System w 60 Min Record Time - 1 Hour Digital - White 1740 ATT1740 pg.1559. 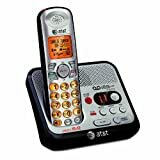 Vtech - DS6151 VTech DS6151 DECT 6.0 2-Line Expandable Cordless Phone with Answering System Silver Black with 1 Handset - Cordless - 2 x Phone Line - Speakerphone - Answering Machine - Hearing Aid Compatible - Backlight VTEDS6151 pg.1557. Vtech - ML17939 AT&T ML17939 2-Line Corded Office Phone System with Answering Machine and Caller ID Call Waiting Black - Corded - 2 x Phone Line - Speakerphone - Answering Machine ATTML17939 pg.1555. Vtech - UP406 VTech ErisBusinessSystem UP406 DECT Cordless Phone - Corded Cordless - 4 x Phone Line - 4 Simultaneous Calls - Speakerphone - Answering Machine - Hearing Aid Compatible - Backlight VTEUP406 pg.1557. Vtech - UP416 VTech ErisBusinessSystem UP416 DECT Standard Phone - Corded Cordless - 4 x Phone Line - Speakerphone - Answering Machine - Hearing Aid Compatible - Backlight VTEUP416 pg.1557. Vtech - AT&T 1080 4-Line Expandable Corded Small Business Telephone with Digital Answering System - Corded - 4 x Phone Line ATT1080 pg.1557.